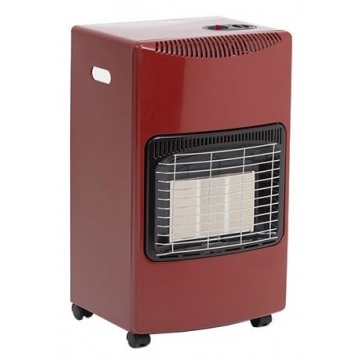 The Lifestyle Seasons Warmth red portable gas heater with a radiant heat output of 4.2 kW is an economical safe practical solution for the heating of any medium sized area. This LPG butane gas cabinet heater runs from cylinders up to 15 kg that can be purchased from Calor Gas, Shell, Flo, etc. gas bottle supplier. Red portable gas heater with 3 heat settings. Maximum heat setting: 4.2 kW. Medium heat setting: 2.8 kW. Dual safety features ensuring that the heater is very safe to use. Flame failure device, if the flame goes out the gas will be shut off. Contemporary hard wearing red finish. Robust body compared to cheaper models. Supplied with butane gas regulator & hose. Height 73 cm (28 ¾"). Width 42 cm (16 ½"). Depth 48 cm (18 ⅞").